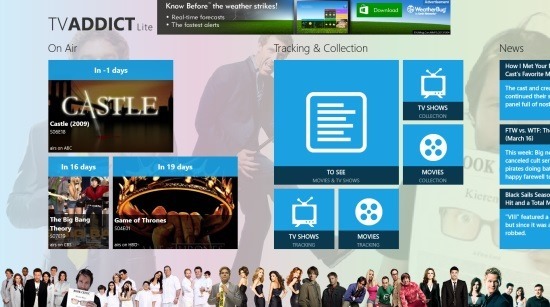 TvAddict Lite is a free Windows 8 TV Show Tracker App. You can use it to keep track of TV Shows and movies. The app provides good details and description about the storyline of various popular TV shows and movies. You can also keep track of a particular episode from a TV Show, that is when would it be aired. In addition to all of this, you can keep track of the shows and movies which you might have borrowed from someone and have to return on some particular date. The app will also provide you with latest news about TV shows and movies. TvAddict Lite is freely available in the Entertainment category of the Windows Store. The main categories that are shown to you at the first time when you use the app are: Tracking & Collection, and News. Apart from that, when you start tracking any particular TV show, a category, On Air, will also appear on the main page. From the main screen of the app, use the TV Shows Tracking or Movies Tracking option that are available in the Tracking & Collection category. As you get to either of them, you would be shown the page where your tracked TV Shows and Movies will be shown. To the upper right side of the page, you would be shown a plus sign. Clicking on it, the search charm of your Windows 8 will open up. There you can input the name of the TV Show or the movie you want to get info for. The search results will show you a number of matches. Choose any of the options. When you get to the next page, you would be shown a description. A poster will be shown, and on its bottom left side there would be an option to add it to your watch-list. After that, if you have searched for a TV show, it would be shown under the On Air category, showing the time till which its next episode is due.If it is a movie then it would just appear there, and not on the main screen. 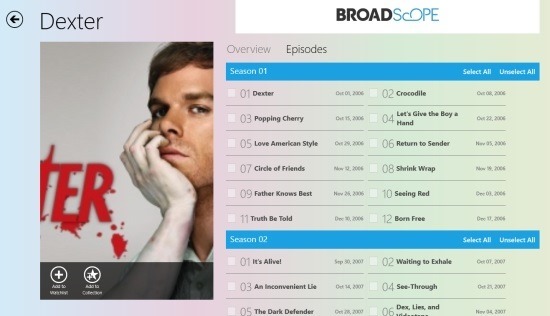 For the TV Shows, you would be shown an Episodes option when you choose the TV show. Choose it to see the list of all episodes. Click on any of it to get detail about it. If you use the Add to Collection option that is available for the search result, you would be shown borrowed option. Go to it, and define the returning date, and switch on the Reminder for it. Also check Trackseries and Supernatural. 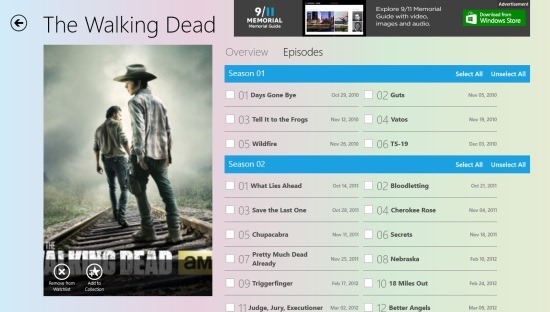 Track your favorite TV shows and movies. Get detailed description of the TV shows and movies. Working with it is quite easy. The app is for free. According to my experience with it, TvAddict Lite is a nice Windows 8 TV Show Tracker app. There is one problem, though, for some of the searched TV Shows and Movies, it doesn’t provide any details. So, it is something you can use to get info for TV shows and Movies, but is not a reliable option. You can give it a try though.